Vitamin B1, also called thiamine or thiamin, is one of 8 water-soluble B vitamins. Like other B-complex vitamins, thiamine is sometimes called an "anti-stress" vitamin because it may strengthen the immune system and improve the body's ability to withstand stressful conditions. It is named B1 because it was the first B vitamin discovered. Chickens are more susceptible to neuromuscular effects of thiamine deficiency than mammals. Thiamine deficiency affects many systems of the chicken's body, including the muscles, heart, nerves, and digestive system. 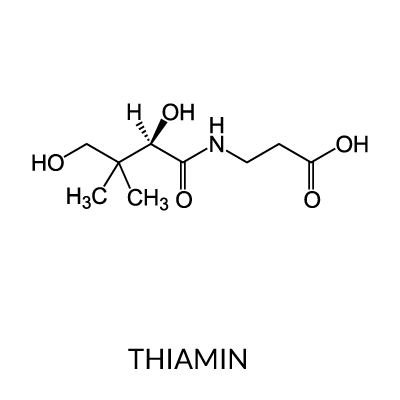 A principal function of thiamin in all cells is as the coenzyme cocarboxylase or TPP. TPP is essential in reactions that produce energy from glucose or that convert glucose to fat for storage in the tissues. When there is not enough thiamin in the diet, these basic energy functions are disturbed, leading to problems throughout the body. Tremors, with the severity of the spasms increased when frightened. As the deficiency progresses, paralysis of the muscles occurs, beginning with the flexors of the toes and progressing upward, affecting the extensor muscles of the legs, wings and neck. Chicks will sit on their flexed legs and draw back their head in a stargazing position, which is often referred to as wry neck. Retraction of the head is due to paralysis of the anterior neck muscles. Chickens will sit on their flexed legs and draw back their head in a stargazing position, which is often referred to as wry neck. Retraction of the head is due to paralysis of the anterior neck muscles. Deficient birds can rapidly detect and discriminate against feeds that do not provide the vitamin. The largest food sources of thiamin is Brewer’s yeast. Cereal grains and their by-products, soybean meal, cottonseed meal and peanut meal are relatively rich sources of thiamin. Provide thiamin-rich food sources, up to 4 mg/kg. Supplementing diet with thiamine or providing dietary sources with high thiamine levels.